"It's in the oven, presents in 15 minutes!" Artsploitation Films has debuted the official trailer for a holiday horror movie titled Red Christmas, from writer/director Craig Anderson. The films stars Dee Wallace, who also produced, as a mother who must protect her family on Christmas Day from a demented stranger. The cast includes Geoff Morrell, David Collins, Sarah Bishop, Janis McGavin, Gerard Odwyer, and Sam Campbell. This looks more like an awkward comedic Christmas version of You're Next than the other holiday horror Krampus. The final kill from this trailer is totally gnarly, not sure if that's a good thing. A mother (Dee Wallace) must protect her family on Christmas Day from a demented stranger who is hell-bent on tearing them apart. 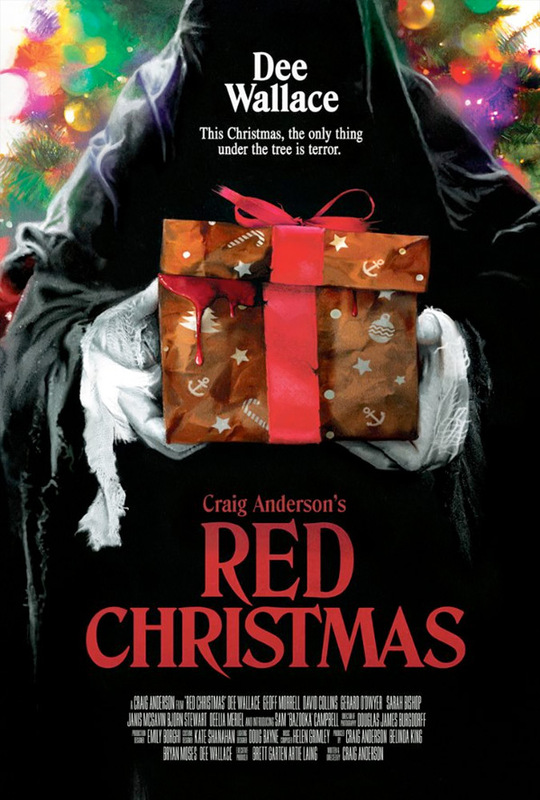 Red Christmas is both written and directed by Australian actor-filmmaker Craig Anderson, making his feature directorial debut after numerous short films and TV work including "Double the Fist", "Black Comedy", and "How Not to Behave". This originally premiered at the Sydney Film Festival, and also played at Fantasia and the Denver Film Festival last year. Artsploitation Films will release Red Christmas in select theaters + on VOD starting August 25th at the end of the summer. Your thoughts?